I always get annoyed when something interupts what I am doing. 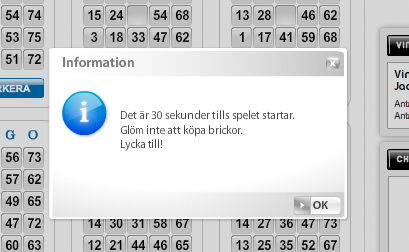 Recently when I was at Svenska Spel and their bingo I got a pop up while trying to buy bingo tickets for the next round. I was selecting tickets when a pop up alert saying “It is 30 seconds until the game starts. Don’t forget to buy tickets. Good luck!”. But WHY did I get the pop up when I was already on my way to buy tickets? On top of that I had to click on the little “OK” button to close it. And it took me a few seconds so I missed the chance to buy tickets in time. And after that I left not having played any rounds of bingo. Not showing an alert would be a much better solution. The system could insted instruct a new player how to buy tickets, a player who have bought tickets many times do not need instructions.